// (c) Copyright HutongGames, LLC 2010-2012. All rights reserved. Love it. Just download as asset and it is automatically added to list in playmaker. Cool. get this, and then within Unity, you can search for let say "destroy", it will list that action, click on get for that action, and it will download it automatically and install it in your project for you. I suspect your problem is earlier, I don't see why this action would perform differently. Could it be that your objects are not tagged properly on android for some reason? I would look into this first. Typically, I would make a scene with just one cube, tagged "hello" nad when you click on that cube you would call this action that destroy objects tagges "hello". If that works, then the action is working, else something is very wrong indeed, and I'll look further. @jeanfabre, it doesn't destroy disabled objects. Is it possible to fix this? Sadly GameObject.FindGameObjectsWithTag only has one parameter, tag. I solution might be to add them to an array after disabling them. 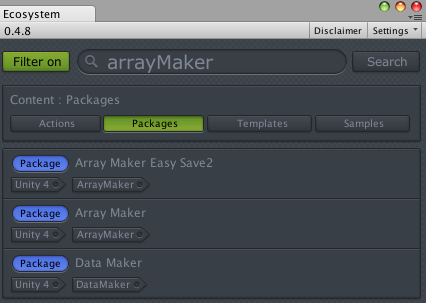 If you get ArrayMaker, you'll have an action ArrayListFindGameObjectsByTag which will give you all objects by tag in a list.